Michigan Commerce - Airsoft Guns Allowed / Re: WTB: Plum cyma/lct midcaps, anything that might strike my fancy. 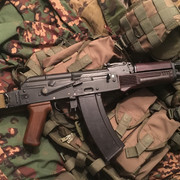 T6e9a, sadly no, do not have an aks-74u to run one with, and my main kalashes are long enough. Topic updated since I caved and ordered one off a retailer. Not going to lie, I have been tempted to get my hands on one of G&G's "AK9" whenever they come out just to feel like part of this new resurgence of PCCs. Updated to reflect desire to acquire a particular item. From what we all saw it seems pretty clear the market direction is continuing on with the pistol caliber models from most manufacturers, alongside speedsoft focused models in either design or coloration. We are also seeing attempts at making stuff even lighter than they already are with polymer SAWdesigns. I did find G&G's tiny magazine ak models funny but kinda had hoped they actually branch out their ak model lines some more. Their CM16 LMG model I see becoming the next beginner attraction if not for the price cost and that we already have folks starting out with hpa kits out of the gate. I would love to see what their concept of an ak platform version would be like though, whether it would just be one of their rk74 models with a drum mag slapped on or something else. As someone who is kinda firmly focused on kalash models yet not going the modern route there wasn't really anything to excite me but then again the market has been like that for awhile with anything that should have been interesting like the Makarovs and whatnot years ago turning out not so hot. About the only thing that sorta interested me at one point was the lct ebb kits but I rather not have to open up one of them just to downgrade spring for field use again. Airsoft Discussion / Re: How go the games at Hell Survivors? No, I am not one in a position to run a game myself. The December game was likely the one put on by Airsoft Alphonse, hence the numbers. I kinda figured what you said was the case, guess I just have to see if I can get out to a field farther away then. Plum grips for my oldest Kalash, hoping she will function at whatever is the next game I can get to. Other recent acquisitions in the past year would be the Sposn Partizan suit, Nerpa Chest Rig, and a cyma ak104/5. Tech Questions / Re: Any techs still out there? Thanks for the offer, wasn't sure if you were still taking on projects. I've managed so far to fix most of my issues, got a soldering tool and managed to not destroying everything using it to put deans on. Despite all the headaches I should have done this stuff years ago. Did that bring back memories for sure. If only I could wind the clock back now. Thanks for the post! Airsoft Discussion / Re: How many mags do you carry? In the few games I have attended this year, I've rarely had to carry more than one or two additional mags, depending on the replica I am using (Bizon for example is a bit more hassle to carry a spare than a kalash). Due to the nature of REC games with multiple reload times and that I have usually stuck to semi only over the years and a speed loader or two usually lasts me long enough in those situations. Of course, that has backfired on me before when I neglect to carry a spare magazine and the current game lasts longer than expected.